DeZwaan Miller Alisa Crawford, and volunteer Bryan Dozeman, look up as Crawford prepares to climb one of the windmill's 40-foot blades. 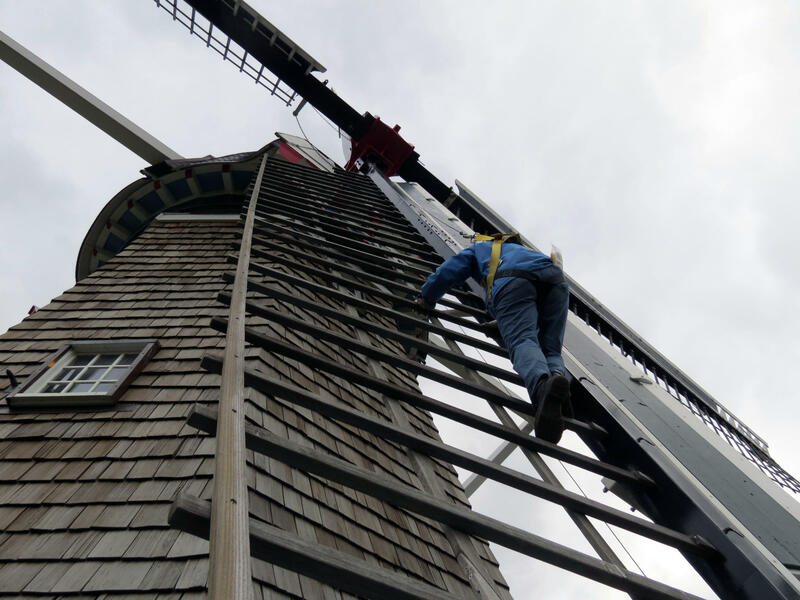 If you drive over a bridge near Holland, Mich., and walk a few hundred feet, you'll wind up face-to-face with a giant, centuries old windmill. So what's the big deal about this one? Well, this structure – the historic DeZwaan – is the only authentic, working Dutch windmill in the United States. It arrived here from the Netherlands in the 1960s, the last windmill to ever leave the country. And today, it is still running. The blades still spin. 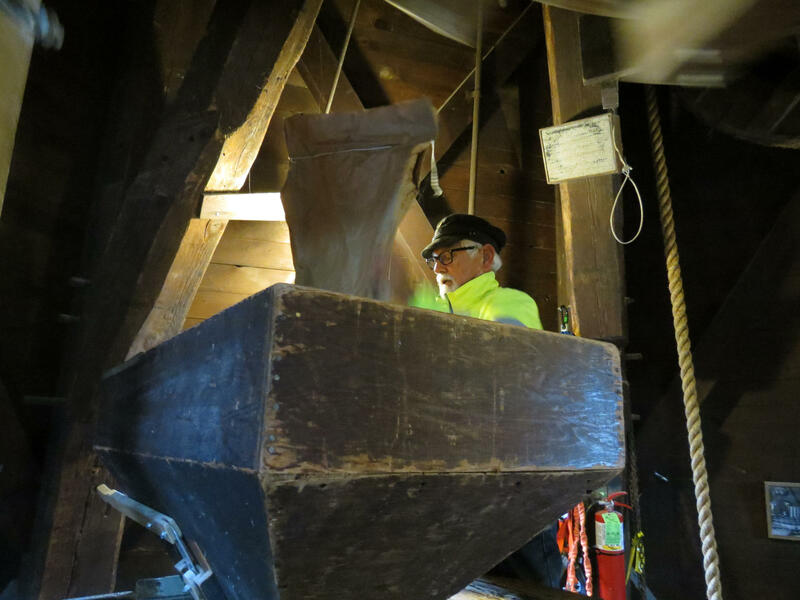 The stones inside still churn, grinding local wheat and corn into flou and sending it out to local bakeries and restaurants. It’s a kind of amazing thing – rare in a world where agriculture and food manufacturing have become global and industrialized. But if you really want to understand what it takes to make this windmill function, you need to meet Alisa Crawford. She runs the mill. On a blustery, late fall morning, Crawford laughs as she anchors the mill's four blades into place. "And this is where you say, Please kids, do not try this at home!” Crawford shouts as she strains to line the windmill up, just right, with the wind. With a few volunteers, Crawford does everything here -- haul grain, set up the blades, maintain the stones. But on this morning, Crawford is doing arguably the scariest part of her job. She’s climbing up each of the windmill’s 40-foot blades, to secure the canvas sails that drape across each one. 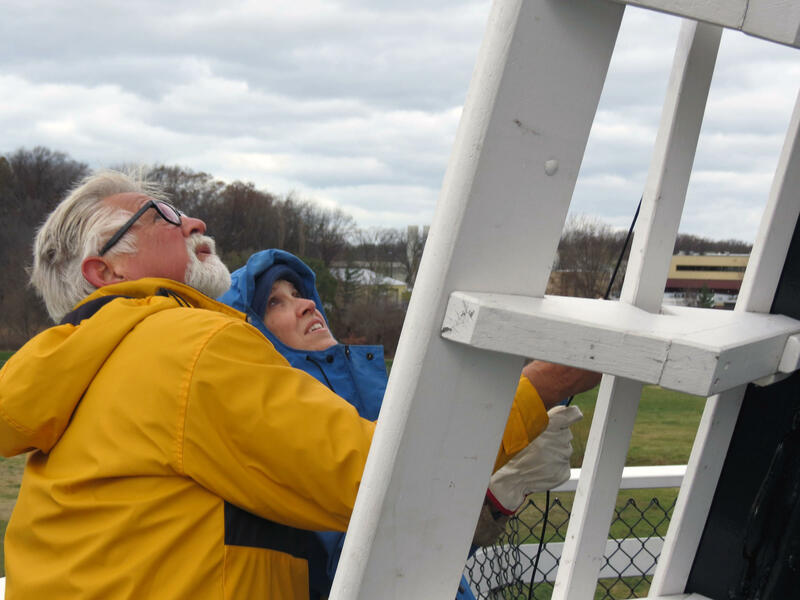 Crawford is only a little taller than five feet, and as she climbs to the top, you can’t help but worry that the strong gusts might whip her away. A volunteer, here, Brian, watches her from below. He says he’s not concerned. She’s tough. You could say that Crawford simply deciding to be a miller was gutsy, too. In the United Sates, the number of working mills, both water and wind-powered, is tiny. But what’s left of the trade is pretty much dominated by men. But Crawford says when she began, that idea never really crossed her mind. She just knew – from the moment she first entered a mill – that this was what she wanted to do. It happened when she was 17, when she first walked into the water-powered mill at the Crossroads Village living history museum north of Flint. "And I was immediately met with the wonderful billowing cloud coming out of the millstones of this fresh, flour dust," Crawford says. "It was just the most remarkable thing! To see these wheat berries turned into fresh flour in front of my eyes. It was so wonderful, I thought I wanted to learn this. I didn't care if this was a job for a girl or not. So I asked the miller, Will you teach me?" It took a little bit of consideration, but he eventually said yes. And Crawford spent the next two years learning the trade. Even when she headed off to college, Crawford says she still spent nearly every available weekend and winter break grinding flour at the village. But there was a downside – all the experience didn’t necessarily bring respect. "I would get these old farmers coming into the mill and go, where's the miller?" Crawford recalls. "And I'd put my hands on my hips and my hips and look back at them and say, you're looking at her! And they just looked really surprised. But then as soon as they saw me grind at the mill, they'd nod their head and go wow, I guess she is the miller." "I joke that it's the small ones you gotta watch out for," she says. "Because I am really pretty strong. The long sleeves hide the biceps, but there is some strength there I've built up. From the age of 17 I've been learning to haul 50 and 100 pound grain bags. So yeah, I can do it." After college, Crawford faced a strange crossroads. She still knew in the back of her mind that she loved these mills. But getting a job as a miller that pays? That’s nearly impossible. So she worked a few museum jobs, in Hawaii, then Michigan. But then, in March of 2006, Crawford saw a job posting: miller, at the DeZwaan windmill, in Holland. Crawford applied. She got the job. And Crawford says she quickly fell in love with the way this windmill felt, and looked, and sounded. There’s a certain music to the whole process, she says. “La Musique de Moulin" -- the music of the mill, as millers call it. Crawford explains. "But in a wind mill, you're listening for the wind, the gusts, the sounds of those wooden gears meshing together, that rhythm, the ebbs and flows. Sometimes the gusts make them go faster, slower. Like music, too. And then you're also listening for the sound of that top millstone turning and the sound of those stones together, with that layer of grain in between, and hearing it get cracked open for that beautiful flour. And the flour coming down the chute. All those sounds that make the milling process." "And when everything is going well, there's a certain reassurance that everything is in place and everything is doing what it should be doing. So you're always kind of listening, always smelling. I smell to make sure there's a correct amount of grain flowing through the stones. If there's too little, you'll smell a little bit of a burning smell, because you need enough lubrication, and if there's not enough, they'll let you know! And there's a sound, a groaning, like they're hungry! It needs more." "Everything needs to be in harmony, the wind power, the height of the stone. It all needs to be that way, and when you get it, it's a beautiful thing. Like a piece of music." But learning this delicate balance – between the wind, the stones, and the flour, takes lots of time and hard work to master. So Crawford, in her quest to really learn this art, took a unique step. She wanted to join the renowned Dutch Mill Society, in the Netherlands. But here’s the thing. Getting an American like her trained in the Netherlands? It’d never been done before. Ever. No American had ever tried. But Crawford was persistent. With the help of a few lady millers in the Netherlands, Crawford asked the society: Could she go through the rigorous, two year training program to become an authentic, Dutch miller? "That was a tremendous question. That'd never been asked before," she remembers. "They had to think about it for a long time." They said yes. But this program wasn’t easy. For two years, Crawford headed overseas for weeks at a time, leaving behind her husband and five-year-old son. 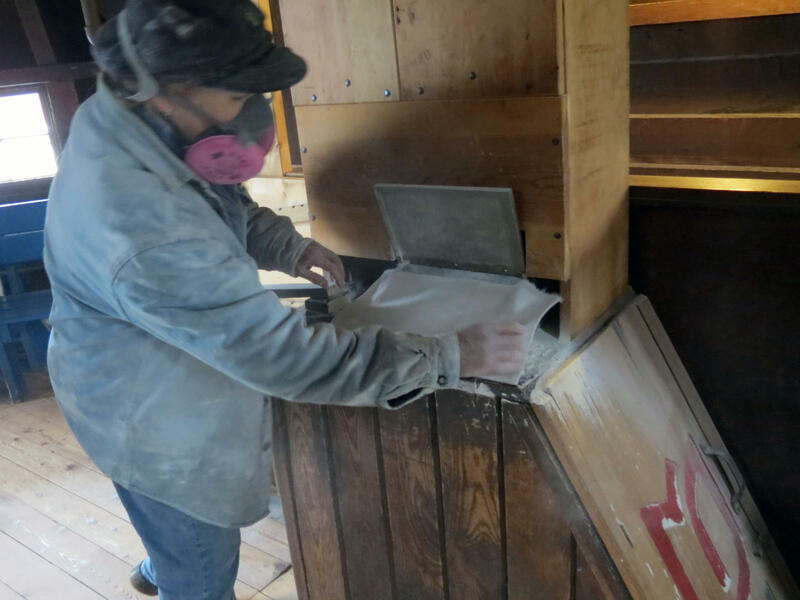 She learned Dutch, relying on flash cards she’d tape to different parts of her mill. Days were spent outside, lugging heavy ropes and sails in the pouring rain. But Crawford eventually passed her final exam. She was now a Dutch-certified miller. The first American. The first woman. Back in America, at her own mill, Crawford tries to explain how she feels about blazing this new trail. She says for her, it’s less about the accomplishments than about the opportunities she has. With that authentic Dutch training, Crawford says she can truly connect the past and the present. "And you show how history is relevant today by still performing this process and grinding grain to produce this product that still blesses our community in a very tangible way," Crawford says. "And to keep that legacy going is an amazing thing that all of us can get strength from. Not just me. And that can be an amazing thing we can share with the community. With her trade being so rare in the United States, Crawford says she can’t help but be concerned about the future of these mills. She says she almost feels an obligation to the DeZwaan mill, to stay with it and keep the tradition alive. "Because once you reach that level, if you kind of abandon that, you’re denying more than just yourself by doing that. Because this is becoming such a rare thing, there's almost an obligation to the field of what you do. To kind of preserve it and continue it." You can read Crawford's book on the history of the DeZwaan here. July 24th marks the 100th anniversary of a huge, yet largely forgotten event in Great Lakes history: the wreck of the SS Eastland. Its story is tragic. June 24, 1915. Thousands board the Eastland from Chicago, including hundreds of Western Electric workers. And then, while still docked, the Eastland tips over, with passengers still on board. People rush to help, but more than 800 die. WMUK's story on the 100th anniversary of the wreck of the SS Eastland. Historian and Archeologist Cheryl LaRoche says she likes to look into legends and lore, stories that have been refuted about slavery and the Underground Railroad.